Has Chicago neighborhood reached a racial tipping point? In the July 27th Chicago SunTimes a feature article is titled, "Has Scottsdale reached the Tipping Point? After recent violence residents from different backgrounds are wondering if the neighborhood will change forever", writes Mark Konkol of the SunTimes. Scottsdale is a neighborhood on the far Southwest side of Chicago that is beginning to feel the affect of the migration of lower income minority residents from inner city neighborhoods impacted by gentrification. In January 2007 I wrote about a report released by the Chapin Hall for Children at the University of Chicago highlighted this movement in the city and suburbs. In Friday's article residents talked about the racial tension that the integration of this previously mostly-white neighborhood has caused, and the potential of "White-flight" similar to that of the 1960's which left many Chicago neighborhoods mostly segregated. I did a search of the Tutor/Mentor Program Locator to see if there were any volunteer-based tutor/mentor programs in the 60652 zip code. While there are three park district sites in the area, there are no comprehensive, volunteer-based tutor/mentor programs listed in our database. In the SunTimes article, one person was quoted as saying "If we continue to have gang problems up here and property damage and drugs, people will move." Why wait to let that happen? Why not create a community/business task force and develop a variety of volunteer-based tutor/mentor programs to provide non-school learning, mentoring and engagement opportunities for the youth in the neighborhood? Such programs can connect youth and adults from diverse backgrounds and head off further racial divisions. You don't need to start from scratch. 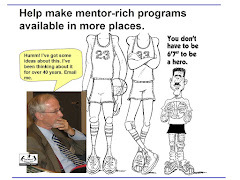 Look at the web sites of tutor/mentor programs operating in the Central part of Chicago. Borrow ideas from them? Invite them to duplicate their programs in Scottsdale. I did a search on Google to get a map of the Scottsdale neighborhood. The Google map shows a list of local businesses who could provide financial support and leadership for comprehensive tutor/mentor programs. They're in the neighborhood. An investment in prevention and workforce development would benefit these businesses. If the alderman, or a business leader, or faith leader would take the lead, a community group could form and build programs that support the integration of this neighborhood and make it a great place for people of all different backgrounds to live and raise families. The story of this neighborhood is repeating all over the Chicago region. Many communities are experiencing a growth of low-income residents but have few or no social services in place to help those new residents climb the social economic ladder. Thus their kids become isolated and are willing recruits for gangs who feed on this isolation. Do something about it. Act now. Change the script. Don't let the 60's repeat. School starts in a few weeks and volunteer-based organizations all over the country are beginning to look for people who will share time, talent and dollars to help them connect with at-risk kids. 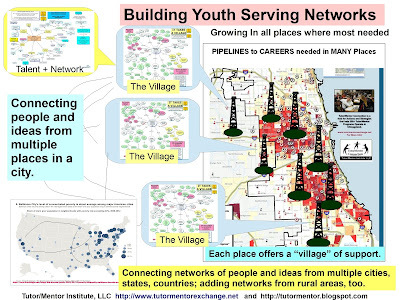 I've been blogging with Suzanne Morse, of the Pew Partnership for Civic Change, and today the title of her blog is New Wiki Articles on Dropout Projects, Mentoring, and Youth Engagement. I encourage you to visit the Act Now section of the Best Practices wiki and look for ways that you can incorporate these ideas into company communications, your United Way campaign, or in sermons and media reports. Once you begin to write about tutor/mentor programs, your next step is to point to links that help people shop for where they get involved. I encourage you to use the Program Locator and Program Links sections of the T/MC web site, as well as national volunteer search engines, to find programs near where you work or live. If there are no programs near you, or if they don't serve a youth at the right age group, then use the information in the Tutor/Mentor Resource Library to begin the steps to start a new program to fill this void. What we do now to help volunteers connect with kids, can help prevent drop outs, gang violence, and make a lifetime of difference for kids who have too few adult supports and learning activities in their own personal network. What's the difference between tutoring, mentoring and a tutor/mentor program? At one you may get homework help, and even sophisticated academic support (if you can afford it). At the other you may make a friend for life. At a well organized, volunteer-based tutor/mentor program you might get both of these (but not a high priced professional tutors). 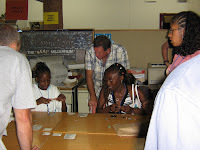 You'll also get to participate in a variety of learning and enrichment activities. At Cabrini Connections youth participate in writing, video, technology and college and career activities. Some of the videos our teens have created are now on-line. Some of our interns and volunteers are now creating blogs that tell the stories of our different learning activities. At the Cabrini Blog you can find links to some of these. In the Tutor/Mentor Institute, one of our interns has converted some of our PDF essays into a flash presentation, showing more of our ideas. This is another example of how young people can use their talent to help non profits reach out for business and foundation support. These presentations are intended to help you understand our concept of a tutor/mentor program, and our vision of a support strategy that would make programs like Cabrini Connections available in many neighborhoods, not just a few. I encourage you to visit these sites and view the videos and blogs. A picture will begin to emerge of a tutor/mentor program as an enriched learning community, only available to high poverty kids through programs like Cabrini Connections. If you value these types of programs, please help us raise the money needed to operate them. If you'd like to apply these ideas in your own program, or in your own community, please show then to others who might support you, and help you. School is starting in a few weeks. Get involved with your time, talent and dollars to help these programs grow. For several years I've recognized the challenge leaders of small non profits have in telling their stories on a regular basis. One solution has been to try to enlist college and high school students as journalists. Ultimately, our goal is that we're teaching our own teens to write about what happens every week in a tutor/mentor program. This week, Nicole White, who is with Cabrini Connections, Tutor/Mentor Connection through a Northwestern Public Interest Program Fellowship, wrote about two activities involving Cabrini Connections students and volunteers. Here's another example. A group of volunteers and teens at Cabrini Connections are meeting weekly, and using a blog to share their experiences. This illustrates what's possible. If you teach journalism, or English, or lead a service-learning program, why not engage your students as writers who tell the story of tutor/mentor programs in Chicago or in your own community. If you share your blog address with us, we'll post it to our web site. On Monday, July 16, 20 to 30 graduate students from Edgewood College in Madison, Wisconsin, will come to Chicago for a three day Chicago experience, where they will host a summer learning workshop for our Cabrini Connections teens. You can read about this on the Cabrini Blog. This connection is intended to help Edgewood students learn about working with inner city kids, while helping our teens build aspirations and habits that help them succeed in school, then move to college, and then careers. We cannot host this connection, or keep Cabrini Connections in business each year, without donations from many different people and organizations. That's why the Jimmy Biggs Memorial Cabrini Connections Golf Benefit is so important. Jimmy was a 4th grader when he joined the tutoring program hosted by Montgomery Ward back in the late 1980s. He stayed with us through high school and then became part of the Cabrini Connections staff. His vision was that he could recruit 100 business leaders to be supporters of Cabrini Connections and the Tutor/Mentor Connection. He died in 2000, before he could make that vision a reality. Since Jimmy helped organize the 1995 to 2000 golf benefits, we've named this event in his honor, and to keep his vision alive. Without the money raised through events like this there is no tutor/mentor program, and kids like Jimmy and the students from Edgewood, along with our many volunteers, would never connect. If you can help support us with a donation, or by playing in the golf benefit on July 19, you're helping many lives be changed. Learn more at http://www.cabrinitmcgolf.org. In the messages I've posted previously on this blog, and in the information you will find in the http://www.tutormentorconnection.org web site, I illustrate the use of knowledge to expand the ideas people have for solving problems. The problem I focus on is helping kids born in inner-city neighborhoods with high concentrations of poverty stay in school, graduate, and be starting jobs and careers by age 25. This is a complex problem because it take 25 years for each youth to take this journey. It requires many different kinds of age-appropriate support in many neighborhood of many cities. This requires a leadership and revenue system that supports the operations of many contributors, just like the funding plan for building a skyscraper provides funding for each of the sub contractors and workers who will be involved in building this structure. Thus, we not only need to visualize a multi dimension blueprint of the type of operating system that would support this mentoring-to-career process in many places, but we also need to create a learning network that enables people from many places to understand the obstacles and to innovate solutions that overcome these barriers. While a web site enables us to collect and share information, it does little good if only a few people look at the information and try to understand it, then act on what they learn. Thus, my role as leader of the Tutor/Mentor Connection is to teach other people to take on this leadership, or network weaving, role. One way I do this is to work with interns from various colleges, teaching them to create blogs and discussion forums where they share what they are learning from me, in an effort to help others learn from them. We have two interns with us this summer. One is Paul Wei, who is from Hong Kong Baptist University. Paul is the second intern I've had from HKBU. Michael Tam was our first intern, during the summer of 2006. 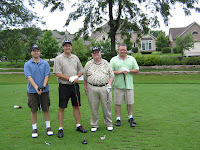 At http://michaelcnt.blogspot.com/ you can read the blog that Michael created and which Paul is now contributing to. While Michael and Nicole are working directly at my offices in Chicago, there are many other people and organizations around the world who are using the Tutor/Mentor Connection as learning resource, with me serving as a coach and mentor whenever they ask questions. In the discussion forums of the T/MC site you can meet some of these people and add yourself to this network. If you search Google for "tutormentor" you can find many other places where a network and share this information. The challenges non profits face in building organizations that constantly improve, and maintain long-term contact between youth and adults are daunting. Unless we find ways to work together to overcome those challenges, few of us will stay in business long enough to succeed, and too few kids will reach their full potential for 21st century jobs and careers. Nicole and Paul are both college age students. Imagine if students in high schools and colleges all over the world were using web sites to learn about problems and to meet with others to innovate solutions. This could be happening, leading to hundreds of blogs like those of Nicole and Paul, with thousands of youth learning to take on leadership roles that use knowledge to innovate solutions to complex problems. If you're a service learning leader, or teaching a college marketing or journalism or problem solving class, consider this as an opportunity for serice, teaching and learning. I hope you'll join us and that you and your students will take on a role similar to Nicole and Paul. I'd like to point you to three places where there are significant discussions going on. First is a post on the Chronicle of Philanthropy Blog. These articles question the blurred role of philanthropy and government in providing resources for community benefit organizations. I feel the Internet changes the paradigm. Someone can post and idea, or describe a social benefit, using a web site. Anyone else in the world who is interested can visit that web site and use its ideas in their own actions and network building. Anyone can take on a leadership role to invite more people to look at this information, and anyone can take on a leadership role to help solve the problem that is being described on the host web site. Thus, it's not a question of "is government or philanthropy doing too much" but a question of "how do we train people to be leaders in using more of their time, talent and resources to solve community or world problems." If we can recruit more leaders who support the potential of volunteer based tutor/mentor programs like Cabrini Connections , we can have more programs like this available in all high poverty neighborhoods of Chicago and other big cities. Over the past 15 years my network has expanded to include peers from around the world. Through this process I've expanded my own tool box of ideas that can help me lead the Cabrini Connections and Tutor/Mentor Connection. I've also shared ideas that I hope will help others help young people in many other places. Last Wednesday evening I flew to England to be a speaker at CWDC’S Integrated Working Conference 2007 for Learning Development Support Services (LDSS) Strategic Managers, hosted by Learning Mentors, which is primarily a school-based support service for at-risk students. I left on Wednesday evening from Chicago and arrived at London seven hours later. I transfered to a flight taking me to Manchester, where a taxi was waiting to whisk me to the conference site about 30 minutes away. I arrived just in time to participate in a workshop on mentoring around the world. One of the highlights was a video created by Claire Kime, who had visited America in 2004 as part of a Winston Churchill Fellowship. I was one of the people she met when she came to Chicago and that was what led to my invitation to the Learning Mentors conference. While I participated in workshops on Thursday and Friday, I also delivered a keynote presentation on Friday morning. I've posted it on the T/MC site so that Learning Mentors participants can draw on it for further deliberations, and so that others in different countries can also draw from this. I flew back to Chicago on Saturday, so my trip lasted a total of less than 72 hours. While this trip lasted such a short time, my hope is that the results last a lifetime. There was a genuine enthusiasm for collaboration and shared learning among the people I met at this conference. While I hope this means some of the ideas from the Tutor/Mentor Connection are used in their own efforts, I also hope it means that some UK leaders take on the same networking role we do, with a goal of enlisting British universities and multi-national corporations as strategic leaders in comprehensive, long-term mentoring programs that expand adult networks and lead more young people to jobs and careers. In the past two days I've introduced the Learning Mentors network to several others who I have met in Internet forums, such as Classroom 2.0. Today, I read a message posted by Christine Gray, CEO of The School Volunteer Program Inc., based in Australia. I sent an e-mail to Christine and told her of the Learning Mentors, because many of the concepts that Christine is applying in Australia could also be applied by Learning Mentors in England. In this role I'm a "network weaver" connecting people and organizations from different places with each other. As others take this role I feel we create a greater public and private sector understanding of the various forms of mentoring and tutoring that lead kids to jobs and careers. If this happens, we can recruit higher visibility leaders who use their positions of influence to draw more volunteers, leaders and financial supporters to tutor/mentor programs in Chicago, and in other cities throughout the world. This can help us do more to help the teens and volunteers at Cabrini Connections. It can help others like me do more to help the kids they work with. I've invited some of the new friends I met in England to introduce themselves via my blog, or the T/MC discussion forum. If you'd like to join this networking, please add your own introduction.